Copper Jack was designed and built to ensure it was accessible to all. Access to the pontoon at which Copper Jack is moored is via a step-free ramp from the quay-side. Please be advised that the ramp is quite steep. Should you require assistance whilst using the ramp, the Crew on-board Copper Jack will be more than happy to assist. The ramp leading from the quayside to the pontoon at which Copper Jack is moored. Please note, the boat shown in this picture is SCBT’s first boat – Black Prince. Wheelchair access onto Copper Jack is provided via a fully automatic lift which is operated by the on-board Crew. 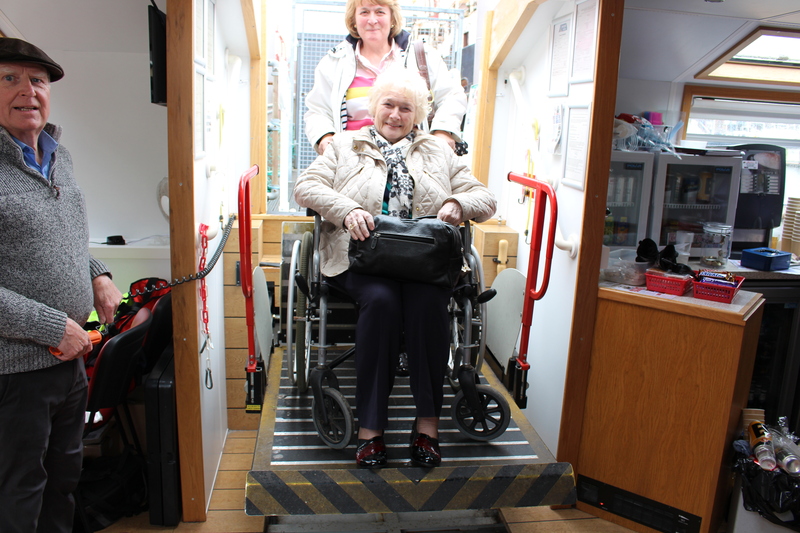 The lift can accommodate a powered or manual wheelchair, occupant and helper. On board there is an accessible toilet, with hand basin and baby changing facility.